May 20, 2017 (SSNA) — After a thorough investigation from different sources, the article that is circulating on the timeline of Deng Gai Gatluak is discovered to have been drafted by Gordon Buay. He then sent it to Deng Gai Gatluak, one of the sycophants of the rogue regime to eliminate it. Deng Gai was appointed as Crown Hotel Youth League leader and a member of President Kiir’s monolog committee. He is known for being an incompetent and unskillful when it’s come to leadership employee. He betrayed the cause for which arms were taken and indeed his own Dad who has been in the wilderness for his own sake. He was lured to Juba with money. The SPLM – IO Youth league conscientiously denounces and condemns in the strongest terms possible the fragmented and heinous crime. My beloved Mother Nyawaat who is the biological mother of Deng Gai is the age of Mama Angelina Teny. Hon Angelina procreated children who are Deng’s agemates. Deng, blinded by material wealth and ego has actually insulted his own mother. This is a fact which has defeated his intelligence because his mini mind has terribly failed him. Deng Gai and those who misled him into committing this serious crime must know that they will not be forgiven by the Nuer community at home and in the Diaspora. They have brought a curse on themselves. What will Gordon Buay and Deng Gai gain out of insulting a senior leader and his wife? It is also known that the false message circulating that Riek Machar Teny Dhurgon (Ph.D.) appointed Hon Angelina as an Acting Chairperson of the SPLMIA/O was concocted and written by delusional Gordon Buay himself. The mistakes and even the forged signature speak for themselves. Gordon Buay and Deng Gai Gatluak who suffer from undiagnosed complexities will live to regret what they have written. There will come a time when they will account for it and maybe lose their own lives. Even Gen Taban who plotted to kill Riek Machar Teny Dhurgon (Ph.D.) for power did not and should not insult Riek and his wife like that. Deng Gai Gatluak has forgotten that his father is a Nuer leader. Riek Machar is one of the community elders and a Nuer Leader. The masters of Gordon Buay and Deng Gai Gatluak know this very well. The issue is all about money. A sound minded person from the 64 tribes will never do that leave alone insulting him and his wife. He deserves all the respect. I assume the Press release was written under the serious influence or under intoxication and lust for power and money. It has actually made us understand that they have not studied law properly. By law, they need to account and will certainly do. Things will settle down and the two will stand in a competent court of law if they will live up to that time. What they have done must land them in court for a sentence on account of defaming Mama Angelina. Mama Angelina is a leading politician and she deserves to be respected in her own right. She is a biochemist who had a proper and formal school, unlike these two guys. Even President Kiir, the man you think that you are defending, will not agree with what the two of you have done. Dr. Majak D’ Agoot is a renowned SPLA General who served in key positions. He does not deserve to be insulted by street boys collected from the morass of social and political irrelevance. There is no reason why he should be defamed in social media. The JCE did not insult the personality of Riek Machar and his wife who is, in her own right, a leader and they will probably not do so. Deng Gai and Gordon Buay will one day answer for this serious crime. They have indeed studied the laws and indeed failed the schools as well. And now the media activists will judge by themselves the antisocial behavior of these two disgruntled employees of the rogue regime. Mama Angelina is a responsible leader, mother and a women rights activist. She is not a loose woman. She is one of the most educated South Sudanese women in the current political arena. The names listed in the release are nonexistent. Nobody should believe them. They are Gordon Buay’s childish work which he used to contaminate, those whom he thinks they are defending. The SPLM – IO Youth League has prepared a legal case with an international advocate for these two men. It will not be long when they will answer for this high-profile character assassination. Cde. 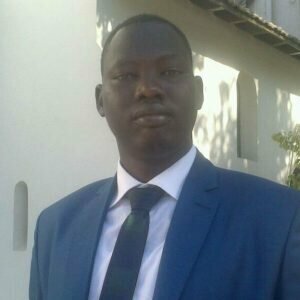 Sirir Gabriel Yiei Rut, SPLM-IO Youth League Spokesman.